I used to think that Sunset magazine was for "old" ladies, boring, stuffy, etc. But after a makeover in the past 3 or 4 years, it has become one of my all-time favorite magazines. 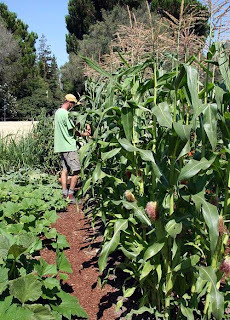 Their gardening articles and recipes are some of the best I've found, especially for a more regional focus. I have also started to think more about the ideas of local food and sustainable living in the last few years, as has just about everyone. I get daily inspiration from my friend Nici and her fabulous blog and my friend Becky, who strives to live an all-around contentious life. I am hoping to do my first real vegi garden next year and these girls will probably get some serious Q& A sessions from me. So, as I was poking around the Sunset mag site the other night, I came across a fun project that is really inspiring. They are using their "office" site, which is actually kind of a little homestead, to create all of the ingredients for a fabulous feast. And they are documenting it with a blog called the one-block diet. Some of the pieces are a bit scarce, but the garden and the chicken teams have done a great job with updates and inspiration. (Chickens are another fascination of mine that I hope to have in the next few years. 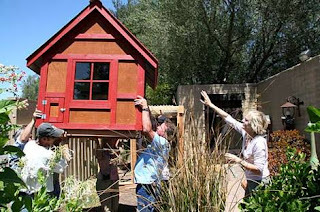 Check out the amazing and super cute chicken coup that they scored!) So check out their progress and get inspired!